Next Stop: Louisville Kentucky. 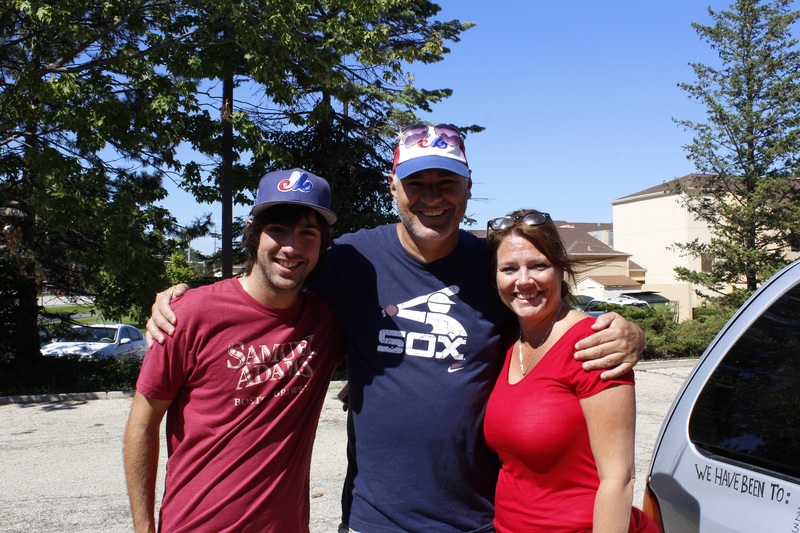 Before leaving Chicago, we met with Yannick and Sylvie: two Quebecers that were also on a baseball trip. They were visiting Miller Park, Wrigley Field and U.S. Cellular Field. They told us a lot about their visit at Wrigley! 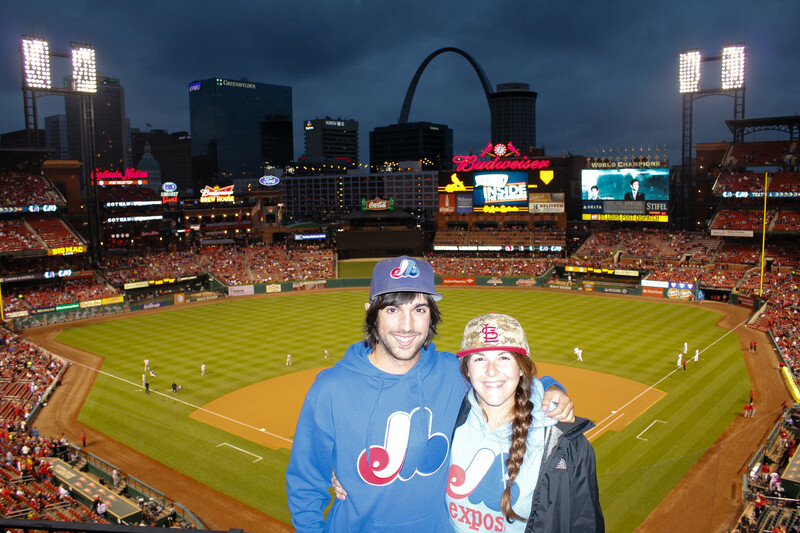 We are very happy to see other people that are also representing baseball in Montreal that are visiting the MLB ballparks. Kentucky is bourbon country. To be labeled this prestigious name, the product must respond to a few criteria like being made in the United States and being created from a mixture made of at least 50% corn. 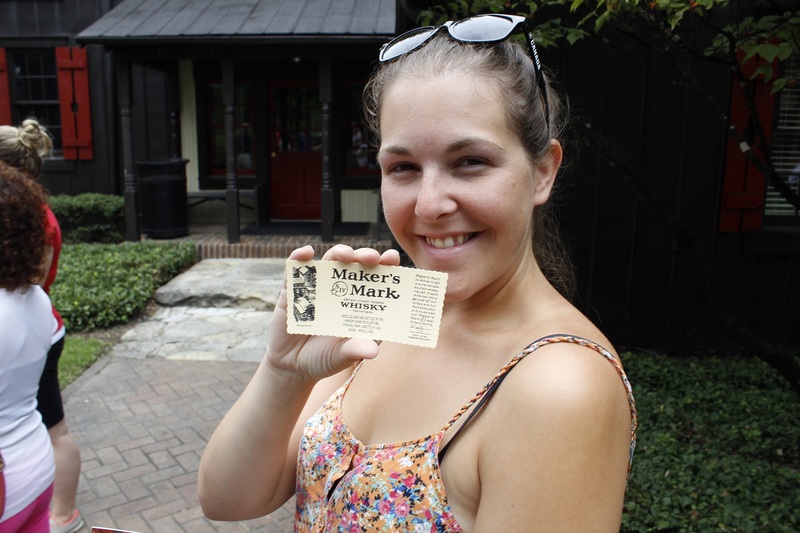 We decided to learn more about it by going to a visit at the Marker’s Mark distillery. This distillery is located on a land owned by a family since the 1800’s but the first Marker’s Mark bottle was sold in 1958. The Samuels family was in charge of creating the bourbon and they believed that their product should be homemade and original. During the visit, we learned more about the fabrication of the bourbon. 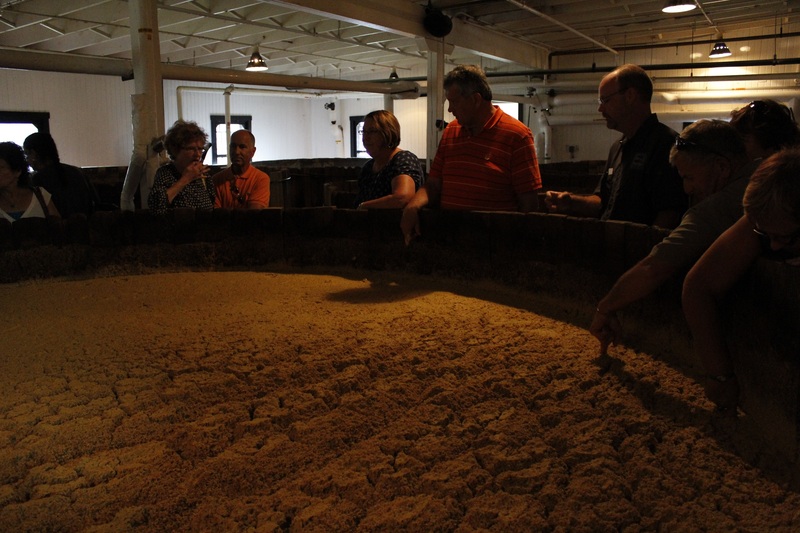 They even let us dip our fingers in the mixture that is going to be used for the next bourbon batch! No double dipping! We visited the storage rooms where are stored the barrels for around 6 years. We also saw the bottling line with the famous last step: the dipping. Employees dip by hand every bottle of Marker’s Mark one by one in red wax to give every bottle a unique seal. We finished off the tour with a tasting of the bourbon. We went over to a campground for the night. Weather was announcing rain and thunderstorms for the night. 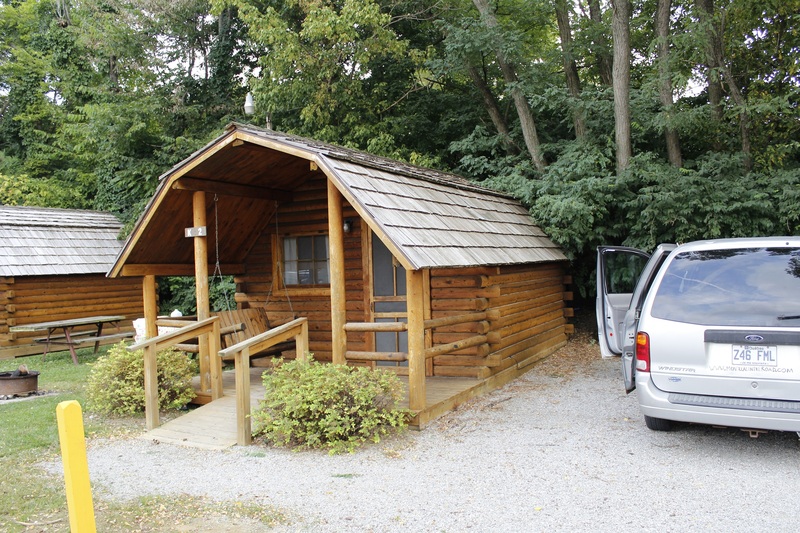 The campground employees must’ve felt bad for us sleeping in our minivan so they offered us, for a few dollars more, to rent a cabin with A\C and electricity! A luxury that we cannot get too often! We spent 2 great nights out there! The next day we went to Louisville to visit the Louisville Slugger factory. This factory created baseball bats for the greatest players: Mickey Mantle, Babe Ruth, David Ortiz, Evan Longoria, etc. 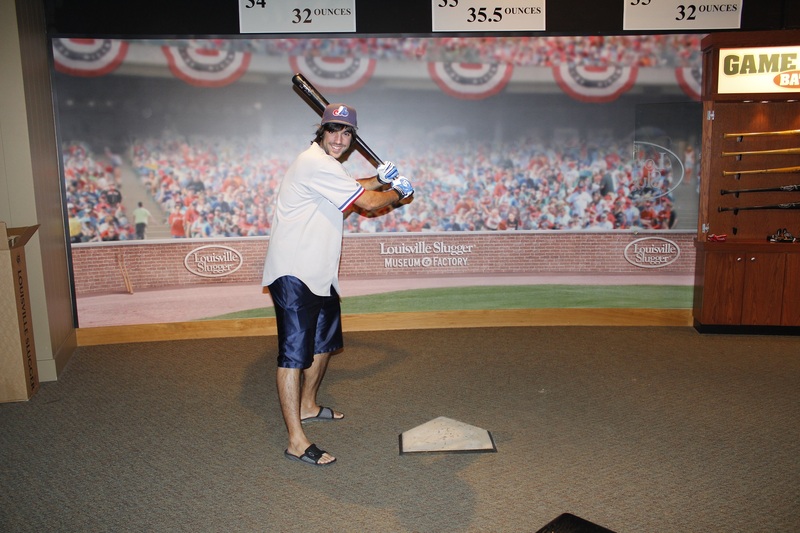 You have the opportunity to visit a small museum with many baseball artifacts. 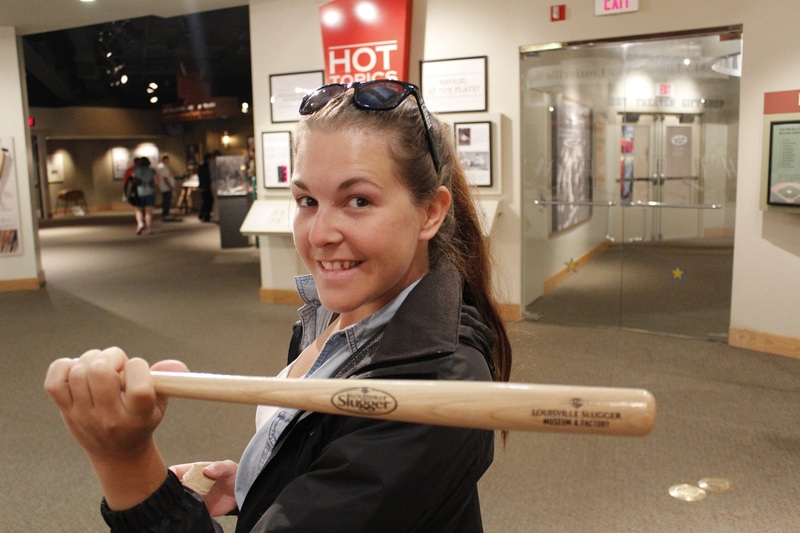 We can even take in our hands used baseball bats by famous players. I opted for Derek Jeter! 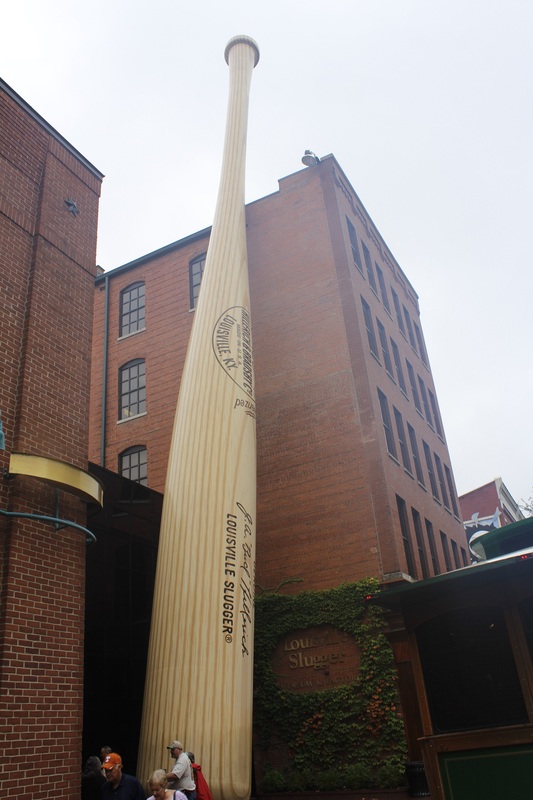 At the Louisville slugger factory, we also visited the factory. Every the bats they produce is made there. We’ve been showed how the bats were made by hand and how they are now made with computerize machines. Still, the logo is branded on the bat by hand and the dipping is also done by hand by employees. When we visited the factory, they were making bats ordered by Buster Posey, catcher for the San Francisco Giants. Saddly, we were not allowed to take any pictures in the factory. At the end of the tour, every visitor is given a free mini baseball bat! After the tour, we watched a baseball movie with the narration of James Earl Gray! We finished off by going to the batters cage where you can try replica bats from baseball players. Adry went with an Evan Longoria Bat and I tried a Mickey Mantle one! We stayed for a few hours in Louisville. It is a really nice city to visit. 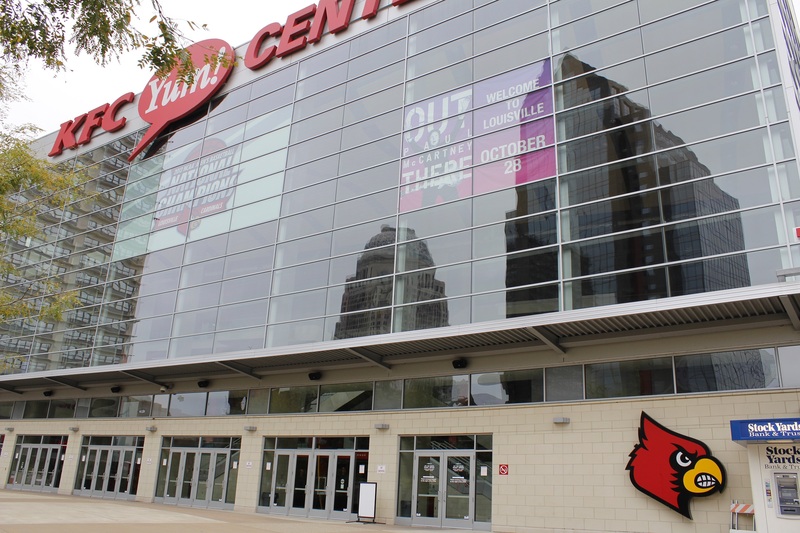 We passed by the KFC Yum center, home of the Louisville University Cards, which is well known for his basketball program. 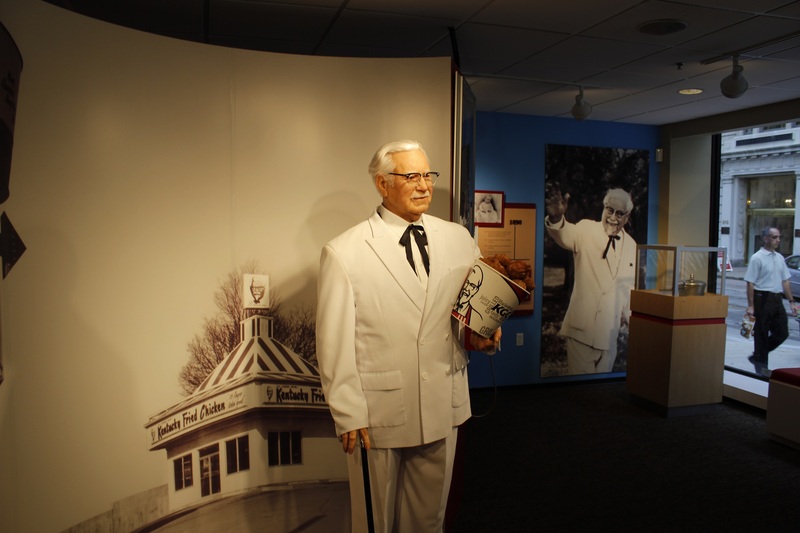 We also found, at the visitor center of Louisville, a small exposition on the about the Colonel Sanders, creator of the famous Kentucky fried chicken. Next day we took the road towards St. Louis, Missouri. First stop (I can hear some people saying that we might be loving alcohol a little bit too much!) 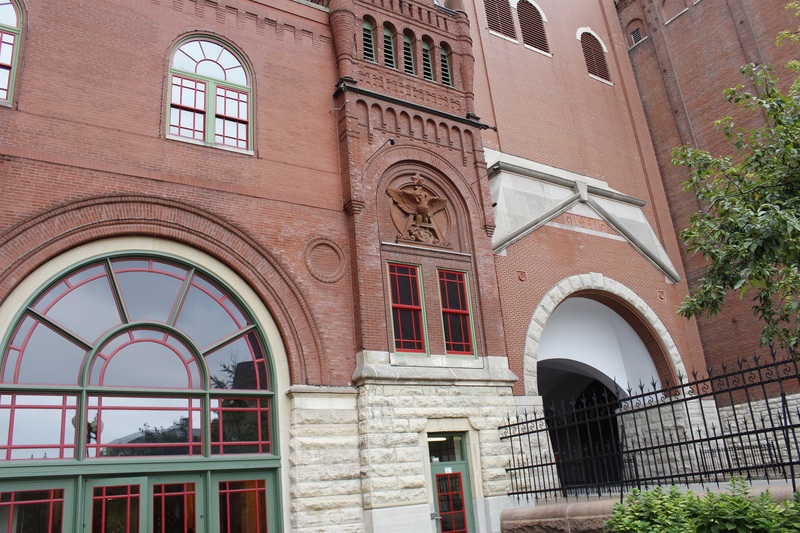 is the Anheuser-Busch brewery: home of the famous Budweiser. 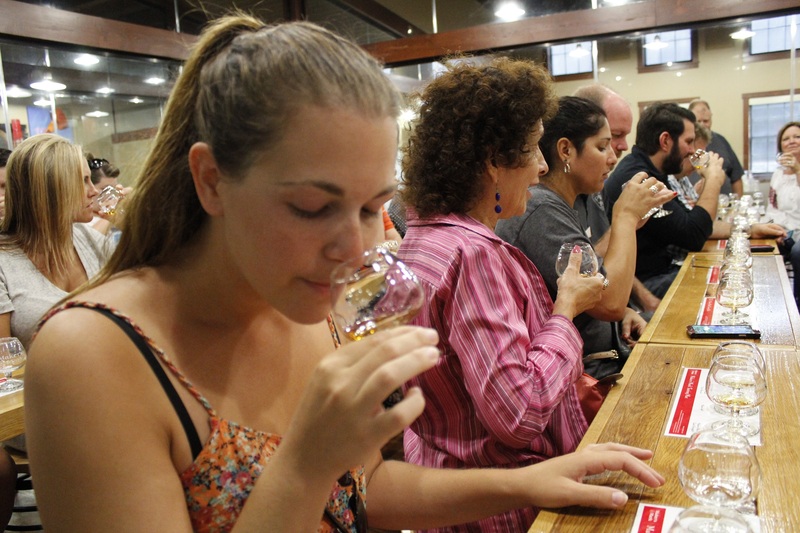 We took a beer class with tastings (and a diploma at the end!) before visiting the brewery facilities. We can say that we were impressed. The facilities are really beautiful: brew house, Clydesdales stables, etc. We finished the tour in the biergarten where we were given even more free beer! Anheuser-Busch was bought by the Belgian beer giant: InBev. This is why they are distributing, in America, brands like Stella Artois, Leffe, Becks, etc. We really appreciated the brewery tour… our 6th of the summer (Samuel Adams, Stone, New Belgium, Coors, Miller and Anheuser-Busch)! 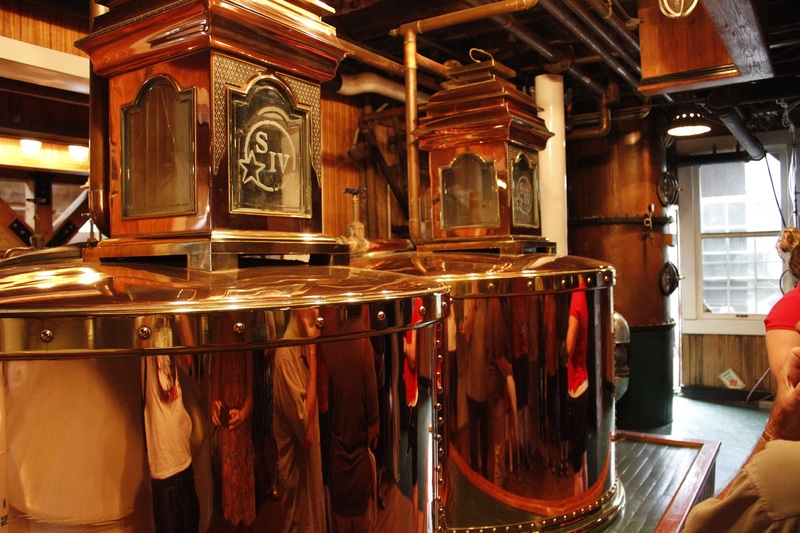 The Budweiser beer is brewed in many different places in the United States. 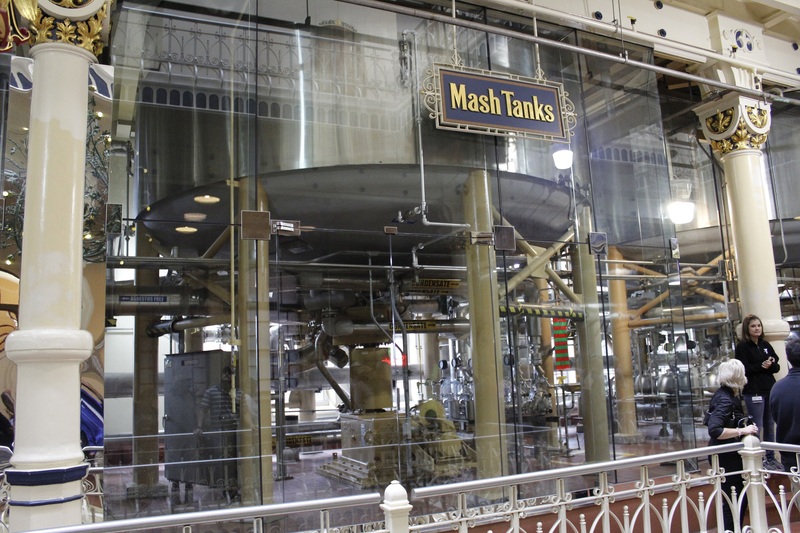 To insure that the taste is the same, the water used is filtered and treated the same way in every brewery. The Secret is in the Yeast! 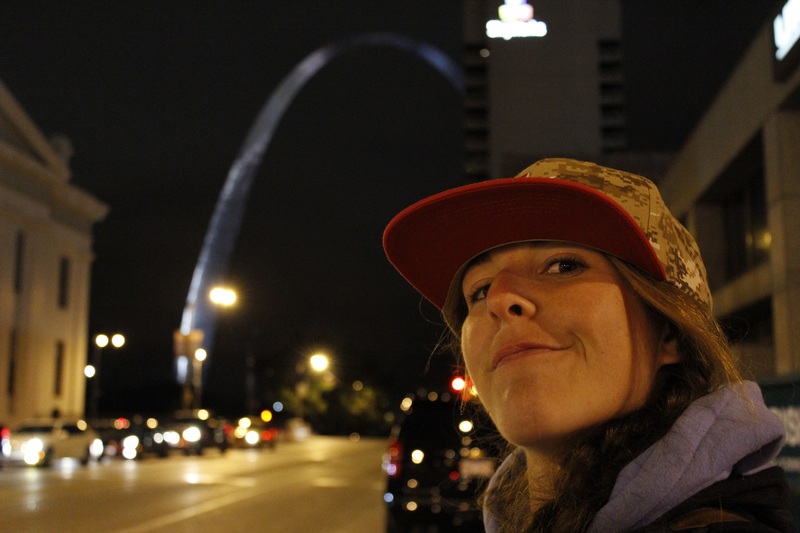 After this, we walked to Busch Stadium of St. Louis. It is the third ballpark in this city to receive this name. This one was open in 2006. 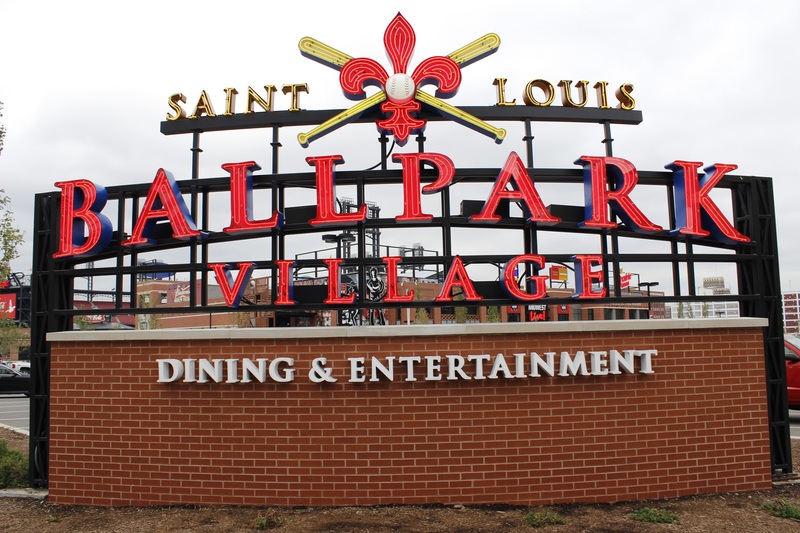 We arrived pretty early since we really wanted to see the ‘’ballpark village’’ of St. Louis. After the destruction of the old Busch Stadium, the organization invested in recreational center right next to the ballpark. 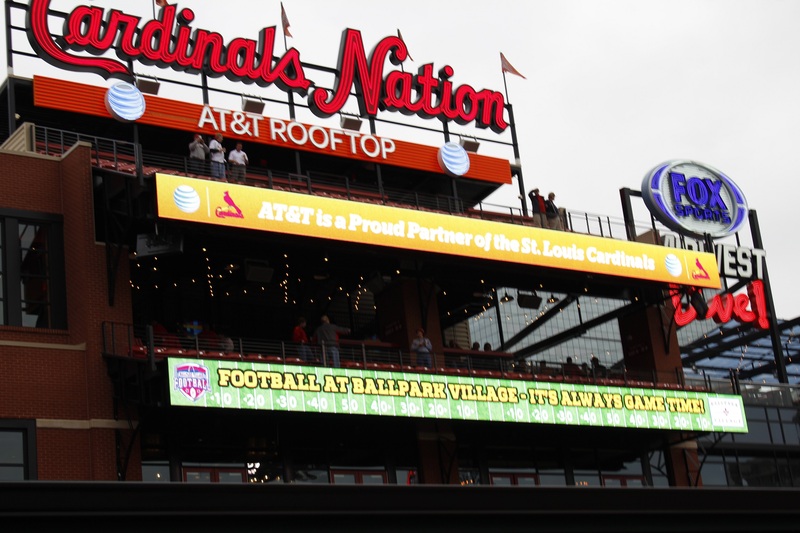 In it, you could find many different restaurant and bars, a deck with a view on the ballpark, a museum and a memorabilia store. We could say that this area gets pretty busy at night before and after the game. Between the ballpark in the Village, they’ve built a mini field with a giant screen where fans can watch the pre-game show and the game itself. You could also just relax by drinking a beer and playing corn hole. It is a really great concept. We realized that a lot of fans were in line in front of the gates. We decided to come closer just to realize that they were giving away free hats that night! It was not in our schedule so we were really excited about it! In the waiting line, we chatted with a big Cards fan. We asked him what interesting things were to see inside of the ballpark… he told us that there was not that much but food and drinks! 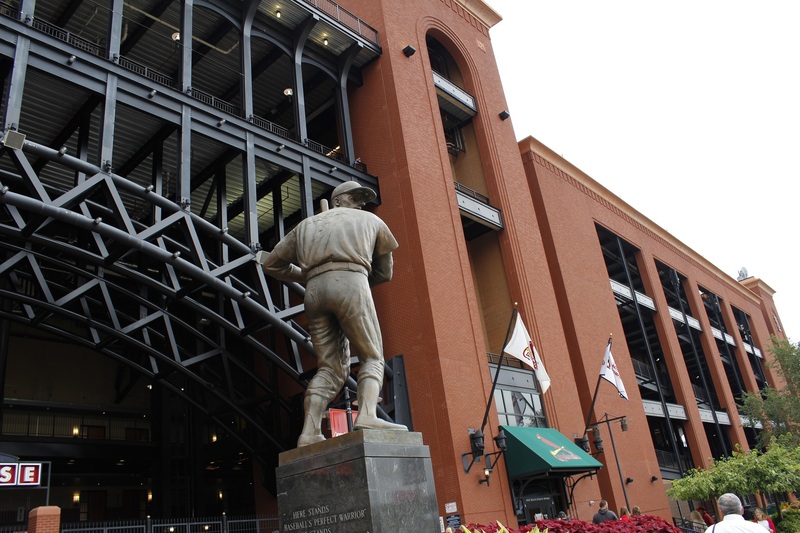 Still, he sent us to see a few statues in front of the ballpark. 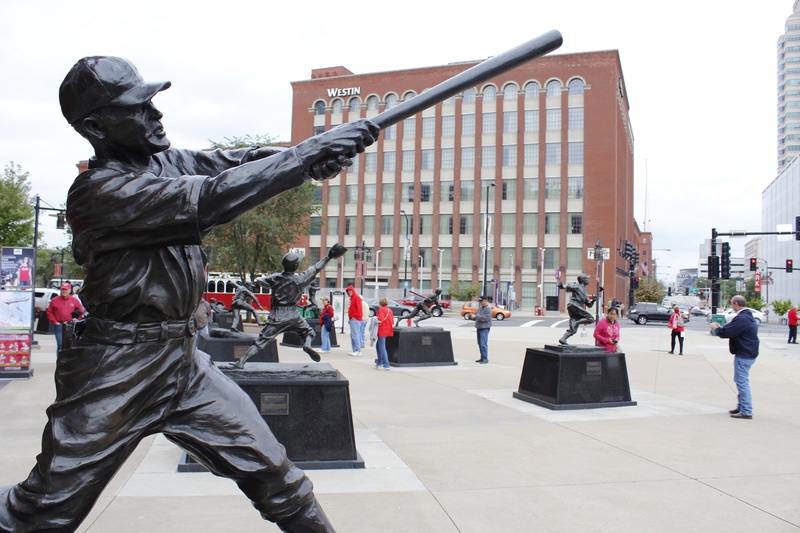 One of them was one of the famous Stan ‘’the man’’ Musial. He also told us that the ballpark was built by the taxpayers, with a grim on his face. The other important thing that he told us is that the fans are really in love with their team. They will be at the ballpark whatever the record of their team. We could say it is easy to say when your team won the National league last season and that you are in first place in your division this year again but we have been told, by people that came on those not so good years that the fans were still coming to games in big numbers. Only thing, for people that love baseball, we received a not so good reception with our expos gear. We even got some fans making fun of us, we didn’t like it. We hope that those were not representing the majority of the fans in St. Louis. 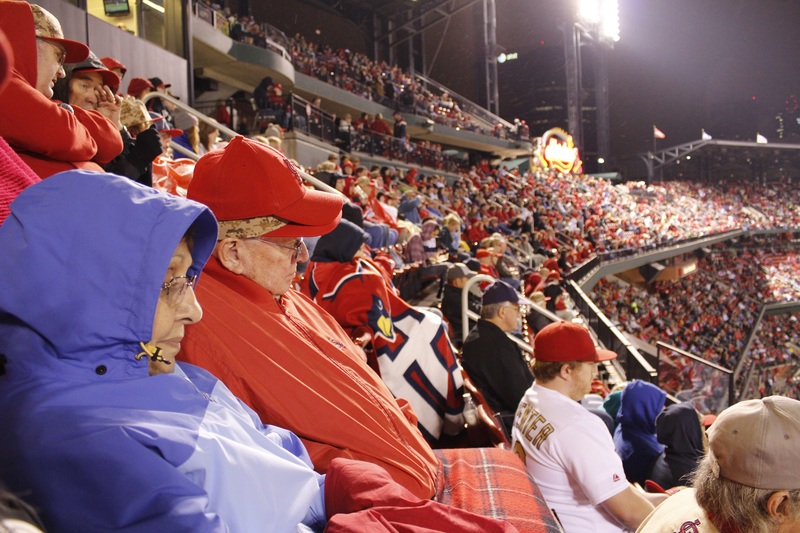 We could confirm that the fans are really faithful to their team since we forgot to tell you that it was really cold in St. Louis for this Friday night! Fans brought their blankets, coats and mittens! Our Canadian blood helped us to survive this game even wearing shorts! We even were lucky enough to get a little rain… but nothing to worry us about the game! We did our usual walk inside the ballpark. 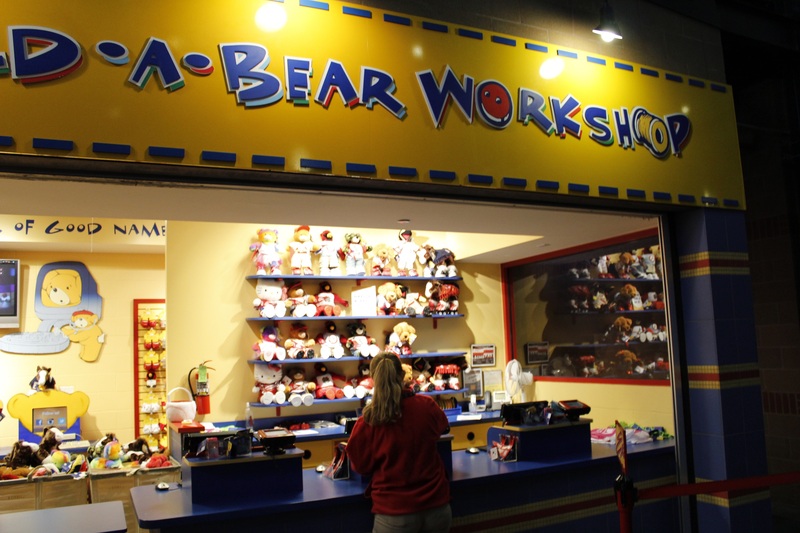 We found the ‘’teddy bear workshop’’: a store where the young fans can create their own teddy bear and dressed it with cards clothes and accessories. We appreciated that the food choice had a great variety. For the beer, well let’s say it’s a Budweiser monopoly! 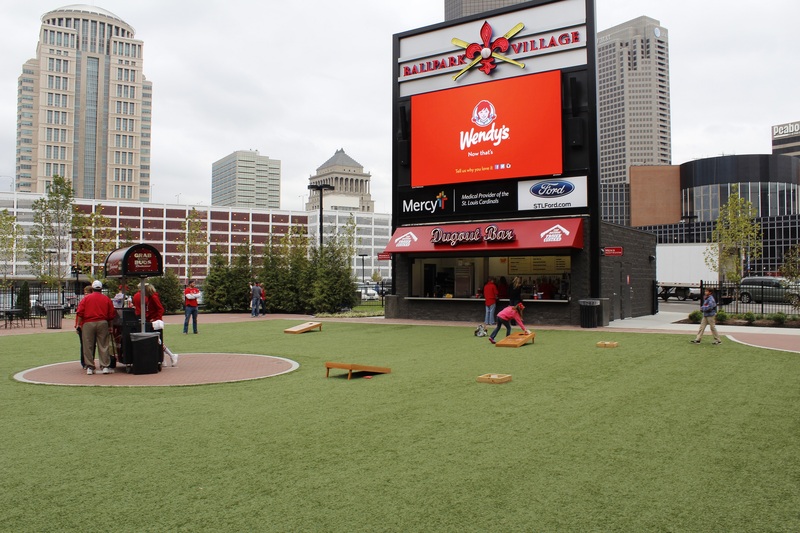 The ballpark has its own Big Mac Land section, honoring the famous slugger: Mark Mcgwire. As usual, a party deck is located in the ballpark! For my birthday (yes 25 years old! ), we had bought good tickets right behind home plate and not too high! We love this view (we’d love to get season tickets at this spot in the next Montreal’s ballpark)! The view of the St. Louis Downtown is really neat and we could also see the Gateway Arch even with the cloudy weather. At the ballpark, we were meeting with Kirby and Jennifer: a couple that we met in Toccoa (close to Atlanta) that gave us lodging out there when we visited the Braves. 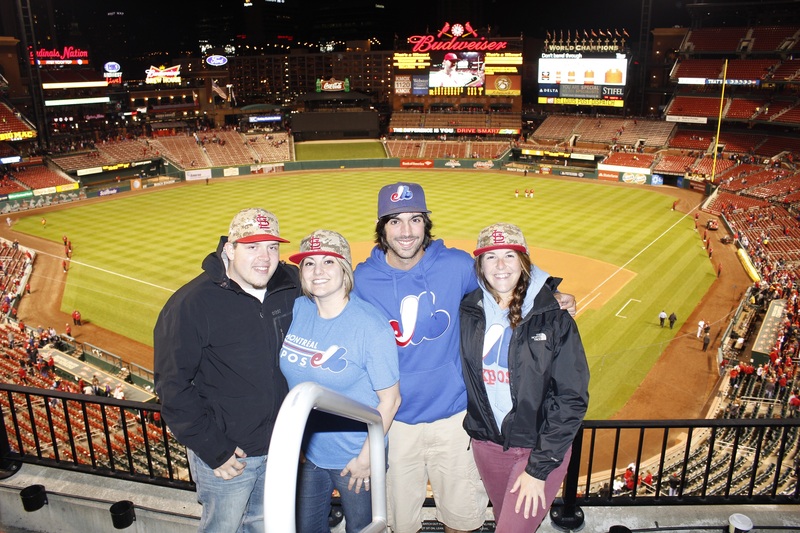 They traveled to St. Louis to visit the city and see a few cards game. We watched the game altogether and we will visit the city with them on the next day (we’ll talk about this tour in our next report!). Baseball time, the Cards were playing against the Colorado Rockies. For the second time in less than a week, we got to see Adam Wainwright as a starting pitcher. Jorge De La Rosa was sent to the mound by the Rockies. 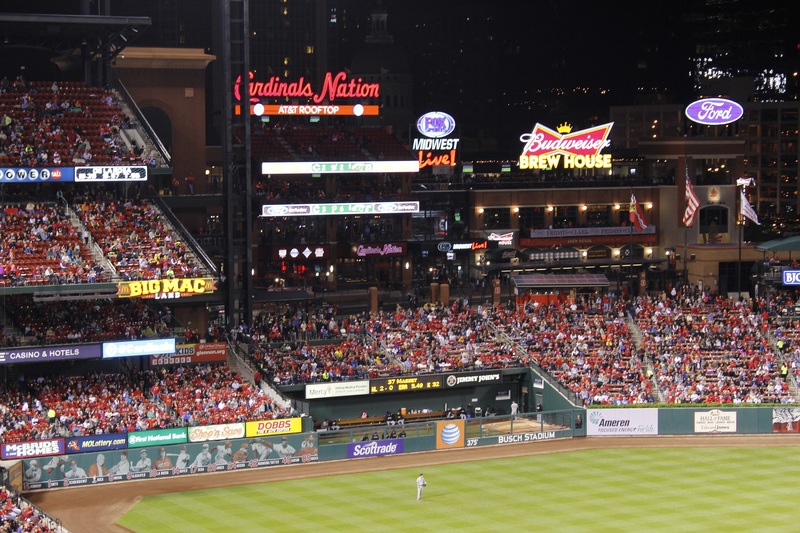 Bottom of the first inning, with Matt Carpenter and Randal Grichuk on bases, Matt Holliday crushed a ball 467 feet away from home plate right into Big Mac Land for a three run home run! Fireworks at Busch Stadium and the Cards are leading 3-0. The next day we would learn that it was the second longest home run in the Busch stadium history. The Rockies are fighter and in the third inning, Nolan Arenado would send Charlie Blackmon to the plate with a double: the cards are leading 3-1. Still in the third, Johnny Peralta will send Matt Holliday home but he would get caught in a rundown heading to second. He is not the fastest or most agile player so he would get tagged for the third out: 4-1 Cards. In the 8th inning, one of the crowd’s favorite, Yadier Molina would add another run for the Cards: 5-1. De La Rosa would get pulled out after 6 innings and 6 strikeouts. Wainwright would pitch 8 innings and get 8 strikeouts. Ken Rosenthal would come as a closer for the Cards. He will finish that game with two strikeouts. Cards won 5-1. They kept their lead in their division on the Pirates. We could say that, for once, we were really hoping for the game to finish early: it was cold and we were regretting not to have brought a blanket for ourselves. We were impressed that most of the fans stayed for the whole game. They were showing a lot of love for their players, especially Matt Holliday and Yadier Molina. ALL the fans at the ballpark were wearing cards shirts and hats! One problem, a fan told us that the concentration of people around the ballpark brought a problem with the large number of homeless. We don’t know what the city’s policy is about that but we feel that it is important that, when you build a ballpark, you have to take this problem seriously. 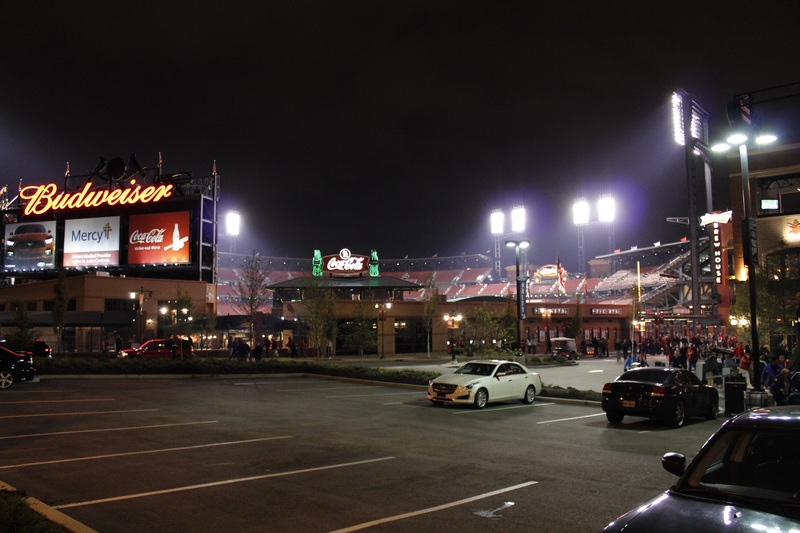 Fun fact, there was a lot of cheap parking around the ballpark, surprising since It is located in the heart of downtown. Other fun fact, we saw a lot of cards fans that were staying at hotels: like if they were flying from other cities in the United States. A hotel employee explained us that people just like to get a hotel for the weekend even if they are not living that far. It’s a great opportunity for them to visit the city and not have to worry about driving around: traffic gets really intense before and after the games. 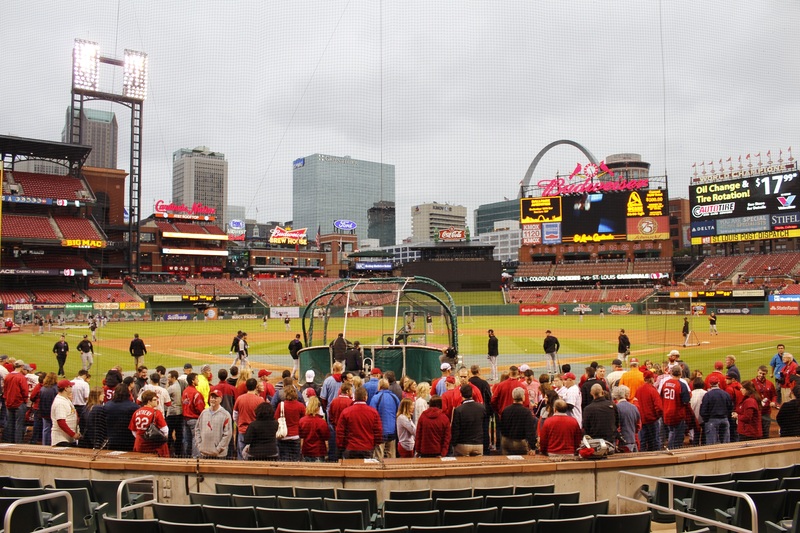 The cards have a great ballpark and faithful fans. Their loss against the Red Sox in the last year World Series was heartbreaking for them but they rallied up this year in they are leading their division. They could be very dangerous in October. 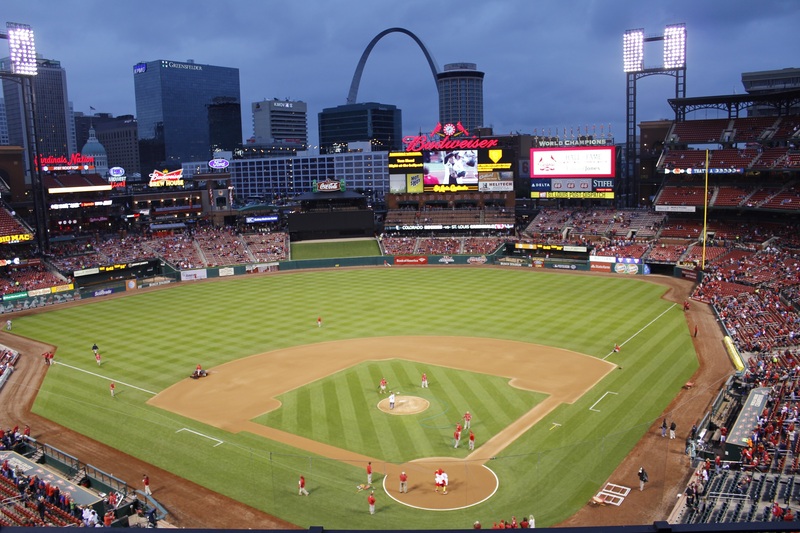 The fans will fill up the ballpark and we don’t think that we would hear about attendance problem or money problem in St. Louis. Next stop: we are heading back to Chicago to catch a Cubs game in the famous Wrigley field! P.S. Did you know that the ‘’Budweiser’’ name was chose since it was appealing to German Immigrants and it was still easy to pronounce by Americans!